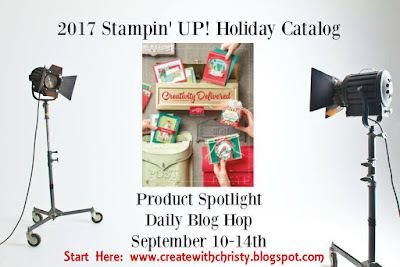 Welcome to Day 5 (last day) of the 2017 Stampin' Up! Holiday Catalog Product Spotlight Blog Hop. Today, we're all featuring the wonderful Pick a Pumpkin Bundle. I fell in love with this bundle the moment I saw it! 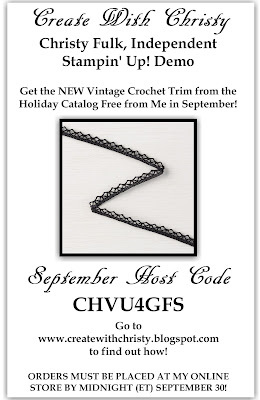 As I've said before, I love Fall projects, and there are so many that can be made with this bundle! Of course, it's perfect for cards, but it's also perfect for scrapbook pages, home decor items, gift bags, boxes, and so much more! I wanted a little glimmer on my card, so I also used the Year of Cheer Specialty Washi Tape and the Copper Foil Sheets. I absolutely love this washi tape! The mixture of metallic colors is marvelous! 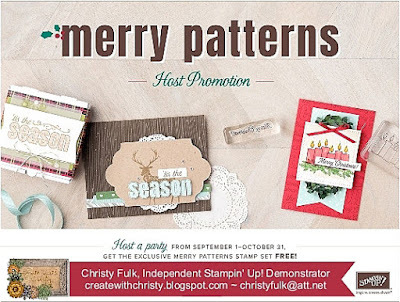 It includes all of the foil sheet colors Stampin' Up! offers...Champagne, Copper, Gold, & Silver! Pool Party 3/8" Shimmer Ribbon: 7"
Fold the Pool Party card base piece in half (fold on top) to make the card base. Emboss the Sahara Sand piece by running it through the Big Shot with the Layering Leaves 3D Dynamic Textrued Impressions Embossing Folder. Stamp the "gather together..." stamp from the Painted Harvest Stamp Set onto the bottom, right corner of the Very Vanilla greeting piece using the Soft Suede Classic Stampin' Pad. Attach the piece across the bottom of the embossed layer. Wrap the Pool Party Shimmer Ribbon around the Sahara Sand piece, just above the Very Vanilla piece, attaching the ribbon ends to the back of the cardstock using SNAIL Adhesive. Attach the Year of Cheer Washi Tape across the top of the Very Vanilla piece, just below the ribbon. Attach the tape ends to the back of the cardstock. Attach the piece to the card base. Stamp the rounded-leaves branch stamp from the Pick a Pumpkin Stamp Set onto the Old Olive piece two times, using the Old Olive Classic Stampin' Pad. Stamp the cattail-like branch stamp onto the Soft Suede piece two times, using the Soft Suede Classic Stampin' Pad. Die-cut all four branches out with their coordinating dies from the Patterned Pumpkin Thinlits Dies. Die-cut a vine out of what's left of the Soft Suede piece using the smallest vine die. Die-cut a pumpkin out of the Copper Foil Sheets using the largest pumpkin die. Ink the tall, pumpkin stamp with the Pumpkin Pie Classic Stampin' Pad. Remove the ink from the pumpkin stem using a Blender Pen. Add ink to the stem using the Soft Suede marker from the Neutrals Collection Stampin' Write Markers, and stamp it onto the last Very Vanilla piece. Stamp the fat, short pumpkin stamp the same way. 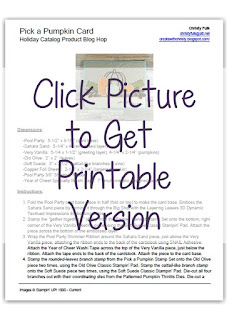 Stamp the designed-pumpkin stamp the same way, but use the Pool Party Classic Stampin' Pad instead of the Pumpkin Pie ink pad. Die-cut the pumpkins out with their coordinating dies. Attach an Old Olive branch and a Soft Suede branch to the back of the left side of the tall pumpkin. Attach the last two branches to the back of the right side of the fat, short pumpkin. Attach the vine piece to the back of the bottom, right side of the Pool Party Pumpkin. Attach the large, copper pumpkin to the center of the card (just above the ribbon) using the Fine-Tip Glue Pen. Attach the tall pumpkin/stems to the left side of the card using SNAIL Adhesive. Attach the fat, short pumpkin/stems to the right side of the card using SNAIL. Attach the Pool Party pumpkin/vine to the right side of the tall pumpkin using Stampin' Dimensionals. Now, it's time to hop on over to the next one in the blog hop, Deena Pavinato. If you're going through the blog hop the other direction, you'll want to go to Valérie Perlin's Blog.